Tesla CEO Elon Musk revealed the very first production Model 3 on his personal Twitter two weeks ago, and since then we haven’t heard very much about it. Tesla is probably holding out for it’s big delivery event this upcoming week, but a Tesla fan has already managed to get a close up video of the car. 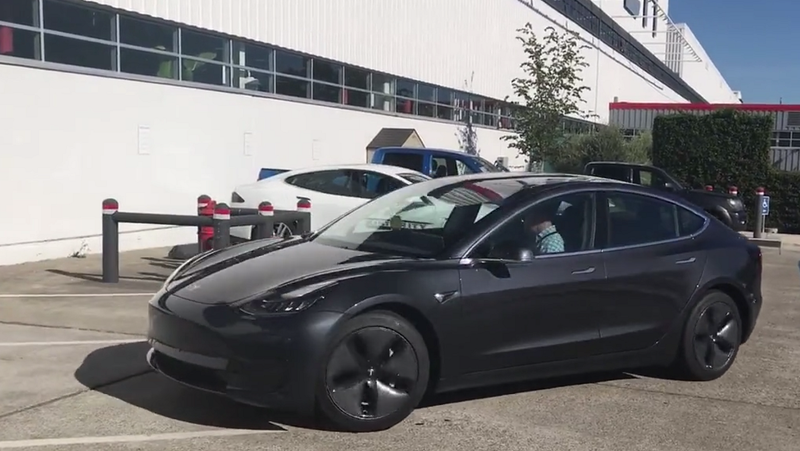 In the video, a self-proclaimed Tesla fan approaches Tesla’s Senior Vice President of Engineering Doug Field as he’s leaving a parking lot in what the video description claims to be the third Model 3 off the production line, via Electrek. We don’t get a great look at the interior of the car, which I’m extremely curious about considering reports of how minimalist it would be over the past year, but we do get to see an interesting brown trim pieced running clear across the dashboard, as well as confirmation of electric seat adjustment, at least for the driver’s seat. You’ll also notice there is no apparent speedometer in front of the driver, as Elon Musk confirmed on Twitter months ago. I have to say, the exterior of this example is much more attractive than the model Musk showed off on Twitter. The smooth grey wheels coupled with the grey paintwork is a good look. This definitely seems like it would be a higher trim level than whatever the base model ends up being, but we won’t know for sure until Tesla opens up to its hundreds of thousands of reservation holders about it. Of course that’s all if this actually is a production model, which it was apparently spotted to be. Field’s hesitant reaction to the question of whether it is a production car isn’t exactly confidence inspiring, but he may have been considering what non-disclosure agreement he’s probably violating at the time. Either way, it’s a sharp looking car, and I’m excited for people to start getting deliveries.